Led by Dr. Muthanna Al-Dahhan, chair and professor of chemical and biochemical engineering and professor of nuclear engineering, Missouri S&T is developing new approaches to understanding how nuclear fuel pebbles would behave in what are called “fourth generation” pebble-bed nuclear reactors and how gas dynamics can effectively take the generated heat. These reactors would house uranium fuel in spheres the size of tennis balls (the “pebbles”) rather than rods, and the cores would cooled by helium gas instead of water. These reactors also are considered to be more efficient than water-cooled reactors and would operate at much higher temperatures. Techniques that are based on radioisotopes for imaging and visualization of opage multiphase flow systems which have been used to measure and track nuclear fuel pebbles and imaging the reactor structure of pebble bed reactors in addition to other types of multiphase reactors and flow systems. A radioisotope is the atom of a chemical that has an unstable nucleus and emits radiation as it decays. Sophisticated techniques to measure various hydrodynamics, heat, mass and kinetics parameters of multiphase reactors and flow systems. Some of these have been used to measure gas dynamics and heat transfer in pebble bed reactors. Augmenting these techniques with sophisticated mathematical algorithms, Al-Dahhan creates computer-simulated visualizations that could help engineers plan future nuclear reactors. Using what he calls “gamma ray tomography and radioactive particle tracking,” Al-Dahhan is able to view what is going on inside a reactor core, in much the same way that a physician uses ultrasound equipment to view movement within the human body. 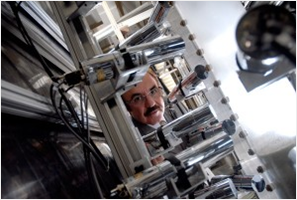 “We can visualize the reactor core and the dynamics of how the nuclear fuel particles behave,” Al-Dahhan says. From that data – and via computational fluid dynamics – Al-Dahhan can create models that predict how nuclear fuel pebbles would behave in a pebble-bed nuclear reactor, and how the helium would disperse heat through the process. Using these measurement techniques could help the nuclear industry set benchmarks for determining how to build fourth-generation reactors, Al-Dahhan says. He adds that the techniques can also be used to set benchmarks for other energy-related projects, such as the design of conventional energy and chemical processes, coal/biomass gasification plants, bioenergy processes, waste treatment processes or conventional nuclear plants including small modular nuclear reactors (SMRs). In addition to leading the chemical and biochemical engineering department, Al-Dahhan is a member of Missouri S&T’s nuclear engineering faculty. The nuclear engineering department also manages S&T’s teaching reactor, which was the first built in Missouri, constructed in 1961. The University of Missouri-Columbia also has a nuclear reactor. This entry was posted in Academic Activities of NISA Members on October 7, 2013 by admin.